The three geographic areas of Peru—coastal, Andes, and Amazon—have plenty to offer both its people and the millions of foreigners that visit each year. But for Peru, its Nationally Determined Contribution (NDC), which strongly emphasizes adaptation, isn’t just a matter of preserving the country’s natural beauty, it is synonymous with sustainable resilient development for the country. This was emphasized by the Minister of Environment, Elsa Galarza, who opened the International Cooperation Roundtable hosted by Peru’s Ministry of Environment in February. Minister Galarza spoke about NDC implementation not only as a key part of sustainable development, but also as an opportunity for Peru to be a leader in the region for the implementation of the Paris Agreement and the 2030 Agenda for Sustainable Development. As one of the first members of the NDC Partnership, Minister Galarza highlighted that Peru is excited about the Partnership’s role in mobilizing resources and motivating the national agenda in Peru. With Peru’s Ministry of Environment celebrating its ten-year anniversary, 2018 is an auspicious year to dive into NDC implementation, which forms the Peruvian response to climate change. The energy and commitment was visible during the Roundtable, which included members of the NDC Multi-Sectoral Working Group (GTM-NDC) -- encompassing 13 ministries and the National Strategic Planning Center -- and representatives of the international cooperation community. Hosted on the 12th and 14th of February in Lima, these actors came together with the objective of establishing alliances and linkages between the needs for implementing the country’s NDC in the short and long terms and the programs and processes of international cooperation stakeholders. The event marked a historic milestone in the management of climate change in Peru, representing opportunities for innovative strategic alliances among sectors responsible for NDC and international cooperation, enabling Peru to fulfill its international commitments. 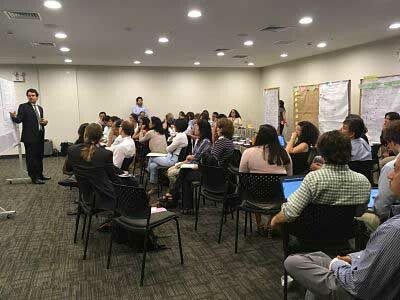 An international cooperation panel explored the different roles that international cooperation can play in supporting the Peruvian GTM-NDC process. Several cooperation agencies shared their respective organization’s focus and areas of alignment with Peru’s stated priorities, highlighting some of their interest in and current work at national, regional, and local levels. Through these discussions, it was revealed that there is an emphasis on taking both mitigation and adaptation action in agriculture, forestry, and land use change. As Peru’s biggest source of emissions, this area also affects the livelihoods, well-being, and opportunities for sustainable development for vulnerable local communities and indigenous people. Several members of the NDC Partnership participated in the event in support of Peru, including the German government through its Agency for International Cooperation (GIZ), the Inter-American Development Bank (IADB), and the UN Development Programme (UNDP), as did the Partnership’s Support Unit. The main message conveyed was that the NDC Partnership can support implementation of the GTM-NDC process outcomes, especially to facilitate coordination and mobilize resources for those needs and priorities that the country decides will require the support of the international cooperation community. The GTM-NDC has sectoral ownership at its core, and this became evident at the event, where representatives from various line ministries took the stage to present the sectoral targets within the NDC and their planned or ongoing programs and projects for mitigation and adaptation, which are linked with their management and planning policies. As a subsequent step, the sectors presented the specific actions where they require support from international stakeholders. Matrices were distributed among the participants detailing interventions, outputs, and timelines to facilitate the identification of potential support. The second day of the workshop consisted of parallel sectoral discussions to link the needs of Peru´s NDC and possible support options from international cooperation agencies. Participants divided up into four groups for adaptation discussions including Health; Agriculture and Forests; Water; and Fish and Aquaculture; and three for mitigation discussions including Energy, Transport, and Industry; LULUCF and Agriculture; and Waste and Housing, to do a deep dive into each area to explore their scopes so that international partners could offer their support, either in the form of a commitment, or a willingness to collaborate. The greatest areas of interest for adaptation focused on Water, Agriculture, and Forests and, for mitigation, on Agriculture and Forests. The event was successful in achieving its objectives. Preliminary numbers indicate that international cooperation is, in general, able to commit support to NDC implementation in the short and long terms. Thus, the Roundtable between the Government of Peru and international cooperation actors set the foundation for focused action ahead as Peru develops its NDC action plan. The NDC Partnership will continue the dialogue with the Government to determine how best to support the GTM-NDC process and align members in support of national priorities. Sydney Stevns is a Country Specialist and Cayetano Casado is a Regional Specialist with the NDC Partnership Support Unit.